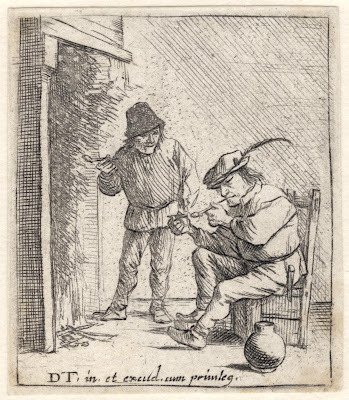 “Two Farmers by the Hearth” (Rijksmuseum title), 1626–90, from the four-plate series, “Farmers” (aka “Peasants”), designed and published by David Teniers the Younger with privilege (as inscribed on the plate). 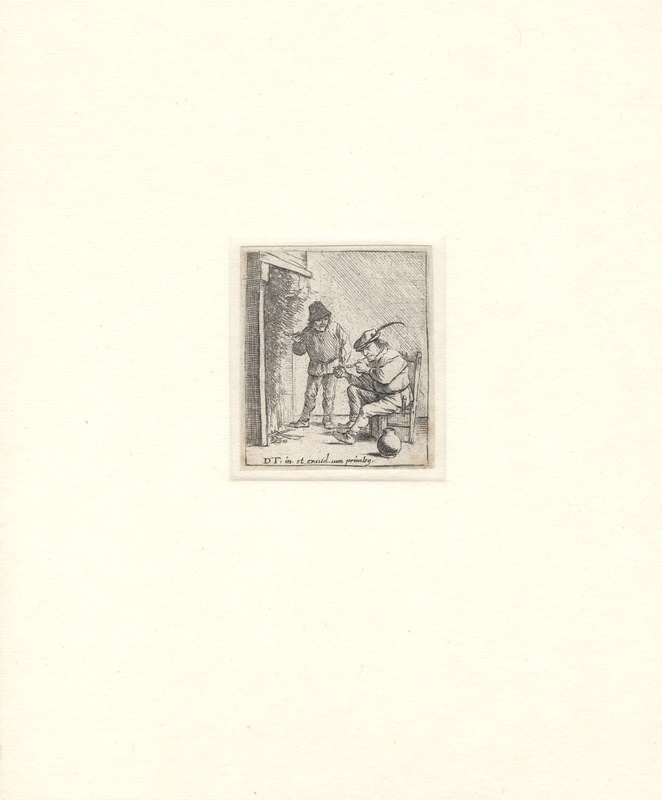 Etching on fine laid paper trimmed along the platemark and re-margined on a support sheet. Condition: slightly silvery impression trimmed along the platemark and re-margined on a support sheet. The sheet is in a very good condition (i.e. there are no tears, holes, folds, abrasions, but there is the faintest trace of residue colouring from once being glued at the corners). I am selling this early, rare and historically important etching showing Flemish peasant life in 17th century for AU$290 (currently US$233.83/EUR188.89/GBP166.79 at the time of posting this listing). Postage for this print is extra and will be the actual/true cost of shipping. If you are interested in acquiring this early etching that helped frame Teniers’ reputation in the development of the genre of tavern and other genre scenes, please contact me (oz_jim@printsandprinciples.com) and I will send you a PayPal invoice to make the payment easy. Once one starts looking at Dutch and Flemish tavern scenes from the 17th century for which David Teniers is famous, a whole new world of social commentary opens revealing how peasants at the time lived. It’s a fascinating field of images to become involved with … but I have a warning: one has to like squat chaps with very square jaws! 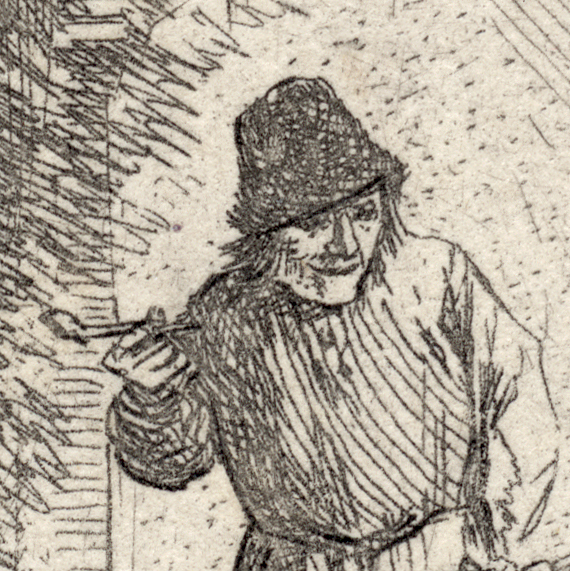 This print is a good start for examining the lives of the rural poor but happy folk. 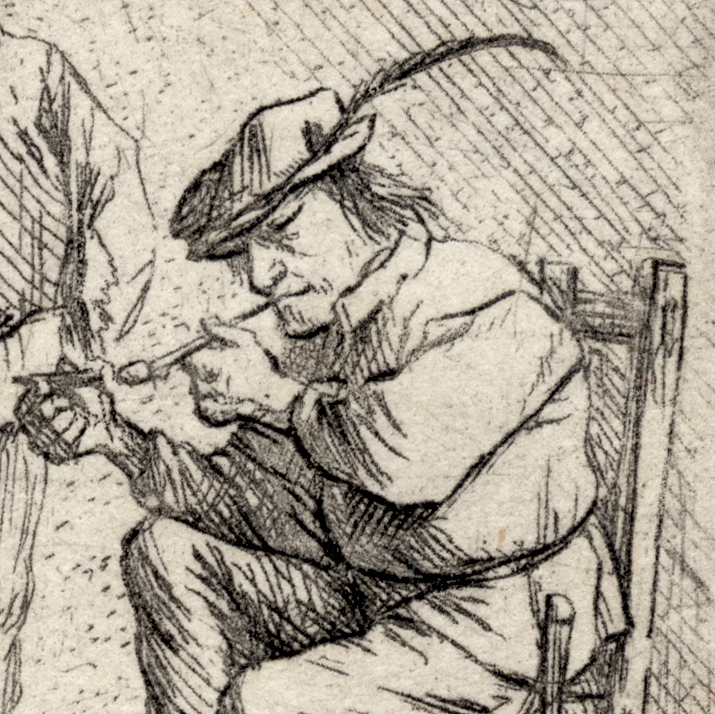 For example note the extra-long feather on the hat of the seated chap lighting his pipe. 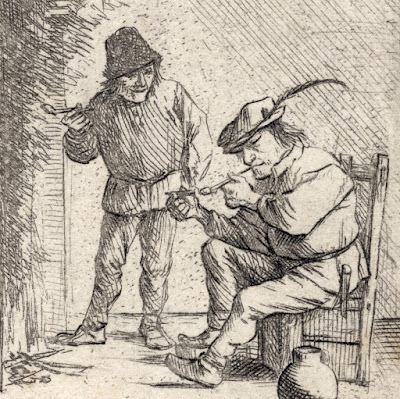 My understanding of what this feather means—or could mean—is that the seated man is a bit of a rakish lad as such a very long feather fits with a certain class of man with a devil-may-care attitude. In fact such a feather is the hallmark of the comic stage character of the time, Peechelhaering, that Gerdien Wuestman (2017) in “Rembrandt and the Dutch Golden Age” (exh. cat. AGNSW) advises was “known for his lack of moderation” (p. 126). I wonder if the shortfall of fingers on his left hand (he only has three) is an outcome of his leaning to take risks? Even looking at the fireplace is interesting. This one is so high that that there is no handy-to-reach mantelpiece above the fireplace to place odds and sods. Perhaps the height of this fireplace means that the scene is set in a kitchen as I recall that kitchen hearths are usually high to accommodate the cook’s pots and pans. As for the impressively dense cloud of smoke in the fireplace, clearly this pair of men have not been attentive to proper chimney maintenance or the fuel that they are using needs a bit more flame.